Who can resist a super lean beef patty, well grilled, topped with a melting American cheese slice, and brushed with a great barbecue sauce, plus caramelized onions ? Not many on my side of the Atlantic Ocean ..or your part of the world ! The good part is that you can add any topping at your taste, some people love mushrooms, poblano peppers, avocado, I love caramelized onions , as they add sweetness to a crispy bacon and salty cheese. Juicy Delight so perfect! Fry bacon at medium low, at desired crispiness, about 2 minutes, remove, set aside on paper towel. Heat your grill or stove grill pan on high, grill the patties, 2 to 3 minutes per side, as you like them done, brush at second flipping with barbecue sauce, then add cheese slice on top of burgers still on the pan. Meanwhile, when almost done, place buns 2 minutes in the oven, till warm, remove. Spread each buns side very lightly with mayonnaise or skip this step. 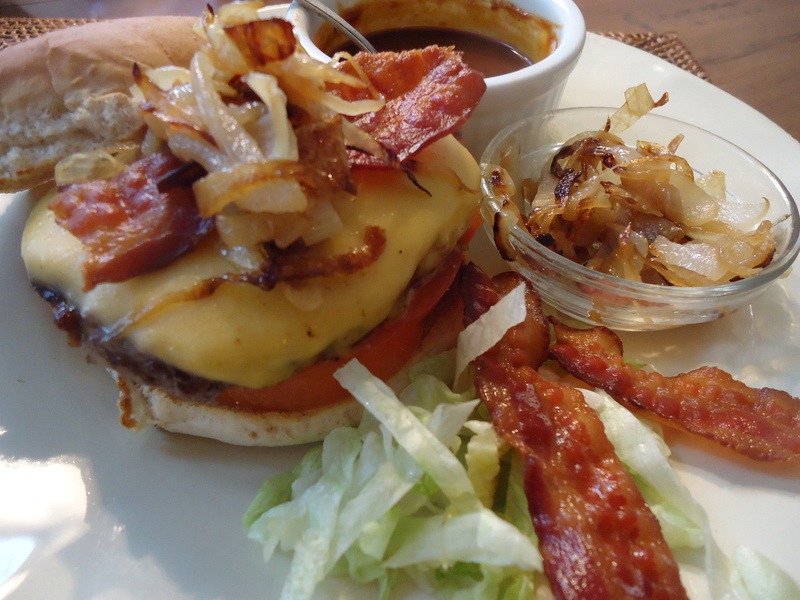 On the bottom bun side add chopped salad first, then the tomato slice, the patty burger with cheese, the bacon slice, top with 1 tablespoon of caramelized onions and the second bun side, serve immedietely with ketchup or other sauce at your taste, and… a very cold beer! Delightful !! !to be enjoyed quickly !!! Before grilling your burgers, chop the onions in thin slices. Heat a medium skillet over medium low, add 1 tablespoon of oil, the onion, let them cook gently at low heat for 10 minutes. Add a good pinch of salt and a pinch of sugar, continue cooking slowly, adding 1/4 glass of water if onions stick to the pan. It needs 20 to 30 minutes of slow cooking, and love, do not stir them too much or cover, just follow up frequently, shaking the pan when necessary!! You can refrigerate after use, 3 days in air tight containe , they keep their goodness!